Key 1992 stat: Zero "Joses." That's right. Don't even bother checking any documents. The old switcheroo: Jose Canseco was a slugger known in the early 1990s for his towering home runs and Hollywood lifestyle. He had an ego as big as his bat, and both were often on display. Then, Jose Canseco's life came crumbling down. He got divorced, arrested and was accused of using steroids as a tool of his trade. With his life in a tailspin, Canseco left the game. 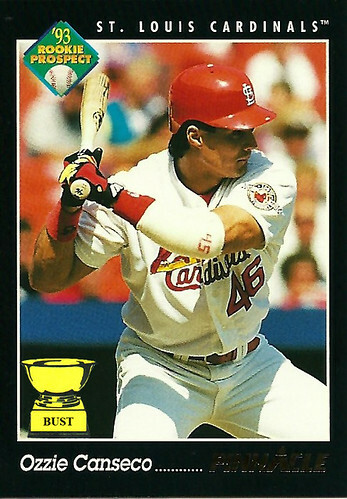 A few months later, the Cardinals signed a slugging outfielder by the name of "Ozzie" Canseco. He hit for power, ran with speed and always wore a shirt that read, "Bash Brother 4 Life." Reporters pestered "Ozzie" about his past. He would shirk the questions and point to what he called a birthmark on his hand. "See, how could I be Jose with this birthmark?" he would say. A reporter would usually speak up and tell him it looked like a circle colored in with a Sharpie marker. "Pay that no mind," Ozzie would say, "I am Ozzie Canseco, brother to Jose, who has disappeared and left me, a clean, sober, law-abiding physical specimen to carry the baseball torch for the Canseco kin." To this, a reporter would usually say, "Jose?" To which "Ozzie" would always turn and reply, "Yes," before running from the locker room.